1. What did John see in another vision? “Now a great sign appeared in heaven: a woman clothed with the sun, with the moon under her feet, and on her head a garland of twelve stars. Then being with child, she cried out in labor and in pain to give birth. And another sign appeared in heaven: behold, a great, fiery red dragon having seven heads and ten horns, and seven diadems on his heads. His tail drew a third of the stars of heaven and threw them to the earth. And the dragon stood before the woman who was ready to give birth, to devour her Child as soon as it was born” (Revelation 12:1-4). 2. Who is this woman? “For the husband is head of the wife, as also Christ is head of the church” (Ephesians 5:23). A pure woman, like the one “clothed with the sun,” is a prophetic symbol for Christ’s church. (See also Ephesians 5:25-27; Isaiah 62:5; 2 Corinthians 11:2; and there are others.) The word “heaven” comes from a word that means “elevation.” The fulfillment of the events presented in this prophecy was to be highly visible and well documented in history. Christ said, “I am the light of the world” (John 8:12). The New Testament church is “clothed” in the light of the gospel of Christ. The moon under her feet symbolizes the Old Testament foundation of the New Testament church. As the light of the moon is merely a reflection of the light of the sun, so the Old Testament ceremonies and prophecies are meaningful only in the light of the gospel. 3. And what does the twelve-star garland represent? “Those who are wise shall shine like the brightness of the firmament, and those who turn many to righteousness like the stars forever and ever” (Daniel 12:3). Symbolically, stars refer to leaders. In the Old Testament “church,” the stars were the twelve sons of Jacob and their successors, the leaders of Israel’s twelve tribes; in the New Testament, the stars are Jesus’ twelve apostles, who spread heavenly light into the dark world. Genesis 49; Mark 3:14-15. 4. Who is the great, fiery-red dragon with seven heads, ten horns, and seven diadems? The “great dragon” of Revelation 12:9 is Satan. Like a chameleon, he changes his appearance by using different agents. During the transition time from the Old to the New Testament church, Satan worked through Rome. “Fiery red” was the chosen color of pagan Rome and is also that of papal Rome. Heads crowned with diadems symbolize governments. Many prominent Bible scholars apply the seven heads to seven forms of Roman government: (1) kings, (2) consuls, (3) decemvirs, (4) dictators, (5) triumvirs, (6) emperors, and (7) the papacy. The horns are the European tribes that invaded Rome and that in time settled into ten European nations (as confirmed by the renowned historian Machiavelli). 5. The dragon’s tail swept away “a third of the stars of heaven.” Who are these stars? The United States has three branches of government: legislative, executive, and judicial. The Jewish government had three branches as well, but they were (1) kings, (2) priests, and (3) the Sanhedrin. After Rome conquered Palestine, the Roman emperor abolished the Jewish kingship but left the priests and the Sanhedrin intact. Thus, the dragon removed “a third of the stars.” See also question 9. 6. What child did the devil incite Rome to kill? “An angel of the Lord appeared to Joseph in a dream, saying, ‘Arise, take the young Child and His mother, flee to Egypt, and stay there until I bring you word; for Herod will seek the young Child to destroy Him’” (Matthew 2:13). When the Jewish church “gave birth” to Christ, Herod, an alien king appointed by Rome, tried to kill Jesus as soon as He was born. 7. What did the future hold for this Child after He escaped from Herod? 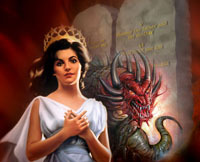 “She bore a male Child who was to rule all nations with a rod of iron. And her Child was caught up to God and His throne” (Revelation 12:5). The Hebrew idiom “rule with a rod of iron” means “to have undisputed rule.” When in the judgment His enemies are arraigned at the bar of God, Christ will mete out justice. Between now and then, having ascended to heaven, He is the Mediator between God and man. 8. Verses 6 and 13 of Revelation 12 say that the woman fled into the wilderness. What do the verses in between refer to? This scene is a flashback, with detail about what Christ did in the time between His birth and His return to heaven (see verse 5 again): He completed all the details of the plan of salvation. He challenged the great usurper and, by His perfect life and His perfect sacrifice, regained the human family for God. “And war broke out in heaven: Michael and his angels fought against the dragon; and the dragon and his angels fought, but they did not prevail, nor was a place found for them in heaven any longer. So the great dragon was cast out, that serpent of old, called the Devil and Satan, who deceives the whole world; he was cast to the earth, and his angels were cast out with him. Then I heard a loud voice saying in heaven, ‘Now salvation, and strength, and the kingdom of our God, and the power of His Christ have come, for the accuser of our brethren, who accused them before our God day and night, has been cast down’” (Revelation 12:7-10). 9. Who is Michael, and what was involved in this war? Michael, which means “who is like God,” is identified as the Archangel in Jude 9. “In Him dwells all the fullness of the Godhead bodily; and you are complete in Him, who is the head of all principality and power” (Colossians 2:9). Archangel means “chief,” or “first,” angel. Christ, “the express image” of the Father (Hebrews 1:3; 1 Thessalonians 4:16), the Commander in Chief of the angels, is Michael. When Lucifer originally rebelled in heaven and, after a confrontation with Christ, was expelled with one third of the angels that had sided with him, the prince of evil was cast down to this earth. Then, when the Son of God came to earth, He invaded enemy territory. Satan and his angels fought bitterly to thwart Jesus’ mission. Finally, they succeeded in having Him tortured and killed. Yet this monumental victory for Satan resulted in his complete defeat! By giving up His life, Jesus won the war! 10. In what sense was Satan cast out of heaven to this earth? At creation, God made Adam the prince of this world, with dominion over the entire planet. Genesis 1:28. But Satan defeated Adam. Satan thus became prince of the earth, gaining access to Heaven’s councils, where he brought accusations against God’s people. (Romans 6:16; Ephesians 2:2; Job 1:6-11; 2:1-5; Zechariah 3:1-5–Joshua’s clothes and presence before God are symbolic.) When Christ died, having resisted all of the devil’s temptations, He won back the position Adam had given up. Now Satan is forever banished from heaven. (John 12:31. Lucifer was expelled from heaven in the beginning–Lesson 5–and again when Christ died.) For the duration of his existence, he is confined to earth. 11. Although Christ has gained salvation for all men, what do we still have to contend with? “Now when the dragon saw that he had been cast to the earth, he persecuted the woman who gave birth to the male Child” (Revelation 12:13). Heaven is rid of the devil. No longer earth’s representative in the heavenly court, he can no longer harass Christ; therefore he concentrates on destroying Christ’s church. 12. What weapons do Christians have in their battle against the great adversary? “They overcame him by the blood of the Lamb and by the word of their testimony, and they did not love their lives to the death. Therefore rejoice, O heavens, and you who dwell in them! Woe to the inhabitants of the earth and the sea! For the devil has come down to you, having great wrath, because he knows that he has a short time” (Revelation 12:11-12). It all adds up to faith in Christ. Exercising faith is the only way to conquer Satan. 13. After Christ returned to heaven, what special arrangement did He make for His church? 14. What did the serpent do to destroy faithful believers all through the Dark Ages? “The serpent spewed water out of his mouth like a flood after the woman, that he might cause her to be carried away by the flood” (Revelation 12:15). In prophecy, water symbolizes many people. Revelation 17:15. The medieval church enlisted kings and civil governments to destroy those who did not submit to the great apostasy in New Testament times. Acts 20:28-31; 2 Thessalonians 2:1-12. 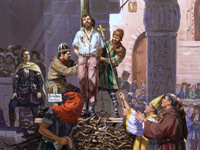 Through the sword, the stake, and the horrors inflicted by the Inquisition, millions of Christ’s true followers were destroyed. But the earth helped the woman, and the earth opened its mouth and swallowed up the flood which the dragon had spewed out of his mouth” (Revelation 12:16). Earth, the opposite of water, denotes a sparsely populated area. In 1620, the Pilgrims found refuge in the newly discovered continent of America. It became the world’s model for religious freedom. 16. Did the devil give up then? Against whom are his attacks especially directed today? “And the dragon was wroth with the woman, and went to make war with the remnant of her seed, which keep the commandments of God, and have the testimony of Jesus Christ” (Revelation 12:17 KJV). Until Jesus returns, Satan and his evil angels will tirelessly harass, tempt, allure, deceive, flatter, attack, and destroy all who will permit it! He especially targets those who remain loyal to God’s holy law and cherish the precious gift of prophecy. Matthew 24:24; Revelation 19:10; Lamentations 2:9. 17. What are two of the many promises Jesus has given to His faithful people? “The name of the Lord is a strong tower; the righteous run to it and are safe” (Proverbs 18:10). “And the God of peace will crush Satan under your feet shortly” (Romans 16:20). When Jesus comes, Satan will be bound and finally destroyed, nevermore to harass God’s children. What about … PERSECUTION IN THE MODERN WORLD? • The world seems more tolerant now. Isn’t religious persecution a thing of the past? Pockets of persecution exist everywhere–from grade school, where the obedient child may be harassed for being “teacher’s pet,” and Bible-believing children are ridiculed for speaking out against evolution, to countries where Christians are abused and killed. Even in so-called Christian countries, persons who seek to stem the tide of increasing immorality by living a Christ-like life are sometimes harassed, threatened, and ostracized. Such treatment will continue as long as Satan is “on the loose.” When people are content with a “form of godliness” (2 Timothy 3:5), Satan is not concerned. But when sincere Christians respond to the love of God and obey all of His commandments, teaching others to do the same, persecution revives. “Blessed are those who are persecuted for righteousness’ sake,” Jesus promises, “for theirs is the kingdom of heaven. Blessed are you when they revile and persecute you, and say all kinds of evil against you falsely for My sake. Rejoice and be exceedingly glad, for great is your reward in heaven” (Matthew 5:10-12). War is frightening. Nevertheless, it is a part of our sinful world. The Bible symbolizes “wars and rumors of wars” in the north, south, east, and west as “The Four Winds.” Who restrains these winds? And what can we do about violence? See Lesson 20 for the answers. 1. Who is the woman clothed with the sun and standing on the moon? 2. Whom do the twelve stars represent? 3. Who is the fiery-red dragon? A kingdom with seven forms of government. Satan working through Rome, both pagan and papal. 4. Who was the child the dragon tried to kill? between Michael and the dragon. won by Satan when Jesus was crucified. 6. List earth’s representatives in heaven, in chronological order. Emperor Constantine and his government. 8. Name the means God has provided to defeat Satan. 9. Now, in the end time, who are the primary targets of Satan’s attacks? Those who keep God’s commandments. The remnant of the woman’s seed, which has the testimony of Jesus.